As with any Hollywood trend, there reaches a point where there is enough material for the comedic spoofs and clever parodies to begin. For superhero films, that began in some part with Deadpool in 2016, a character known to be self-aware of his status as a fictional character. And yet, it feels like Teen Titans GO! To the Movies may actually be a more clever, referential look at the comic book movies than that, just with a few more fart jokes thrown in. It seems that all the major superheroes out there are starring in their own movies -- all but the Teen Titans. 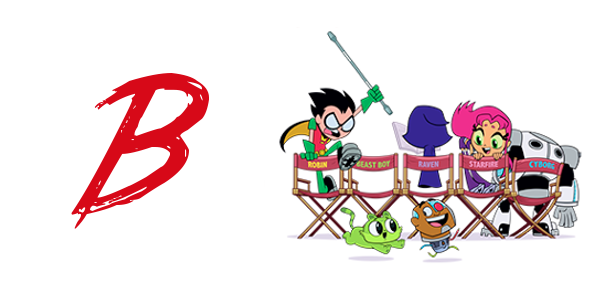 Robin (Scott Menville) is bound and determined to remedy that situation by becoming a star instead of a sidekick. With a few madcap ideas and a song in their hearts, the Teen Titans head to Hollywood to fulfill their dreams. Things soon go awry, however, when a supervillain plans to take over the planet -- putting the very fate of the young heroes on the line. In a similar fashion to Incredibles 2 earlier this very summer, animation proves once again to be a viable medium for the superhero fare audiences have come to love over the past twenty years. The cartoonish action and otherworldly powers are not limited by the realistic nature of the film, and thus can be completely ridiculous, in a good way of course. That’s not to say that the film is all visual, not in the slightest actually, as Teen Titans GO! to the Movies may be one of the smartest animated films in recent memory. To write something like Teen Titans GO! to the Movies with such clever and witty comedy is an accomplishment in and of itself. However, the way that the film interweaves these elements into a coherent story makes for a great spoof. It takes this cultural moment of superhero films dominating every facet of entertainment and continuously jabs at anyone and everyone in the comic book movie game. Being a DC Comics aficionado is definitely not a requirement to enjoy the film, but it will certainly help when the deep cut references pop up. While most audience members should get the satirical moments revolving around modern day superhero films, the nerdier stuff is reserved for those in the know. And yes, Teen Titans GO! to the Movies is clearly made for children, with fart jokes and juvenile humor galore, but it manages to blend them in with enough references for the adults that everyone can enjoy this animated delight. Teen Titans GO! To the Movies is a model for how to handle meta-comedy on a level that’s fit for all ages. With acknowledgement of unknown characters like the Challengers of the Unknown to the immensely funny Stan Lee cameo in a DC film, there is a little bit for everyone is the this cleverly handled animated flick.